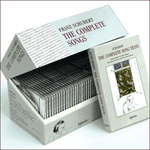 Berger’s songs are mostly simple and are clearly meant for amateur performance. Nevertheless, they have a terse kind of effectiveness and greater sophistication than a preliminary reading first reveals. 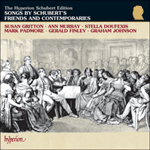 There are two songs here where the Schubert enthusiast will not be familiar with the texts—Am Maienfeste which gives words to a character, the hunter, who stays ominously silent in Schubert’s cycle, and Rose, die Müllerin for the Maid of the Mill who only speaks in reported speech in the Müller version. Ich hab’ das Grün so gern! Horch! Hörst den Waidmann pfeifen! Ich hab’ das Jagen so gern! Durch Sonnen durch flochtenen Fichtengang. Sieh’ nicht so bleich du Müllersmann. and strew the ground with green reeds. Listen! Do you hear the huntsman whistling? If only I could roam with him! through sunlight, through paths of entwined spruces. and don’t look so pale, miller.